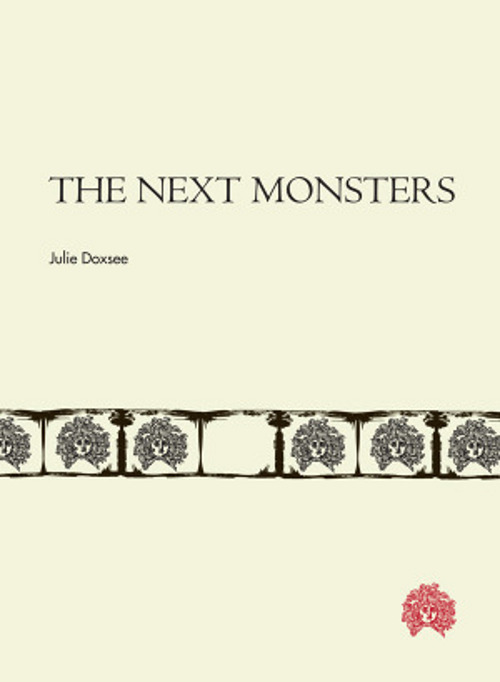 The Next Monsters, by Julie Doxsee. Black Ocean. 78 pages. $14.95, paper. Doxsee’s poems are shattered mirrors; they are fractured, jagged. If you stare at them long enough, you’ll uncover patterns in the chaos, hints of a larger image that was perhaps banished to a new and frightening dimension when the mirror was broken—like the big moment at the end of Prince of Darkness that leaves you feeling unwell. They are also beautiful, filled with fog and wild animals, magic 8 balls and fish guts, the achingly sad sounds made by empty houses. Doxsee never limits what her poems can do. And this is what I love most about poetry: the way image can coexist with sound, or the way the smallest detail can rip holes in the universe, or how sometimes an unexpected word, a loosely associated turn of phrase or sonic inversion, can change everything. Like shards of so much brokenness, not all of these poems—or even the individual lines within each poem—fall into place easily. Reading The Next Monsters, I felt urged to watch black-and-white movies that take place inside drafty and cavernous mansions, places out of the way out in the country where rain never stops pounding on the windows. Instead, I settled for YouTube videos of cave divers, men and women who risk their lives to navigate hidden and inhospitable spaces. The very idea of it is enough to quicken the heart, to pull more and more oxygen through your blood. The Next Monsters at Amazon.com. The Next Monsters at Black Ocean. David Peak’s most recent book, Glowing in the Dark , was released by Aqueous Books in October, 2012. He is co-founder of Blue Square Press, and lives in Chicago.